Ultra-rare genetic variants, including non-recurrent copy number variations (CNVs) affecting important dosage-sensitive genes, are important contributors to the etiology of neurodevelopmental disorders (NDDs). Pairing family-based whole-genome sequencing (WGS) with detailed phenotype data can enable novel gene associations in NDDs. We performed WGS of six members from a three-generation family, where three individuals each had a spectrum of features suggestive of a NDD. CNVs and sequence-level variants were identified and further investigated in disease and control databases. We identified a novel 252-kb deletion at 15q21 that overlaps the synaptic gene DMXL2 and the gene GLDN. The microdeletion segregated in NDD-affected individuals. 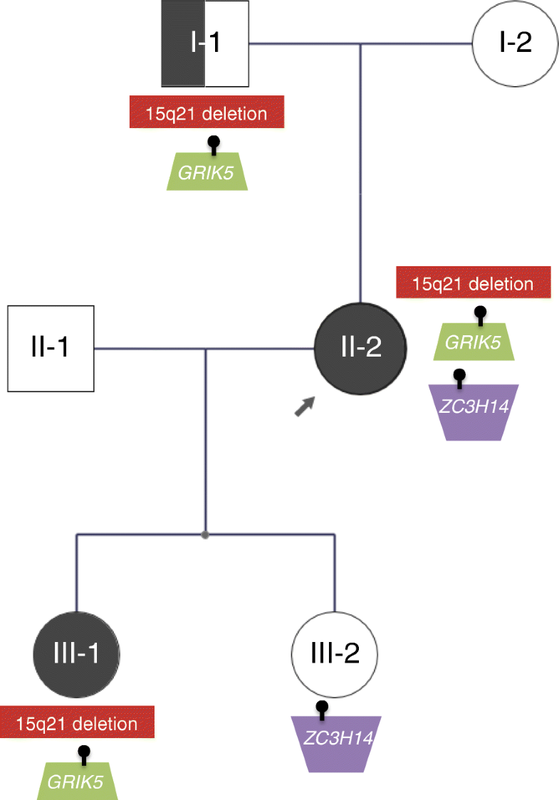 Additional rare inherited and de novo sequence-level variants were found that may also be involved, including a missense change in GRIK5. Multiple CNVs and loss-of-function sequence variants affecting DMXL2 were discovered in additional unrelated individuals with a range of NDDs. Disruption of DMXL2 may predispose to NDDs including autism spectrum disorder. The robust interpretation of private variants requires a multifaceted approach that incorporates multigenerational pedigrees and genome-wide and population-scale data. Rare genetic variants can contribute to the etiology of common neurodevelopmental disorders (NDDs) such as autism spectrum disorder (ASD) [1–7], attention-deficit/hyperactivity disorder (ADHD) [8, 9], intellectual disability (ID) [10–12], and schizophrenia [13–17]. Marked genetic heterogeneity contributed to the recommendation that genome-wide chromosomal microarray (CMA) be a first-tier genetic test for individuals with selected NDDs [10, 14]. CMA along with whole-genome sequencing (WGS) technology have allowed increasing detection of genomic alterations such as copy number variations (CNVs) affecting important developmental genes [10, 18–20]. These variants are difficult to adjudicate through parental testing alone, as even established “genomic disorders” can demonstrate highly variable neurodevelopmental and neuropsychiatric expression [21, 22]. Many are inherited from a putatively unaffected parent, who may have sub-clinical traits or a history of symptoms suggestive of an undiagnosed psychiatric condition . WGS represents a comprehensive platform for detection of coding and non-coding sequence-level, CNV, structural, and mitochondrial variation [1, 24–26]. There are two main contemporary strategies for discovering NDD genes based on CNVs [18, 27]. One begins with a unique variant in a proband and involves a traditional family-based study design with deep phenotyping and curation of all genomic variants. The other involves searching for genes or loci that are overrepresented in large datasets of rare genetic variation assembled through clinical testing or research consortia. In this study, we combined these “depth” and “breadth” approaches to characterize a small non-recurrent CNV of uncertain clinical significance. We sequenced the genomes of six individuals from a single multiplex NDD family and propose that a novel 15q21 microdeletion is the likely genetic lesion involved, because of haploinsufficiency of a synaptic scaffolding protein encoded by DMXL2. The adult proband contacted our research group requesting to participate in our ongoing genetic studies of ASD, after clinical CMA testing had revealed a 15q21 deletion of uncertain significance. History provided by the proband was supplemented by review of all available lifetime medical and psychiatric records. The proband and five family members across three generations provided DNA samples for WGS, and written informed consent was obtained for all participants. After the initial submission of this manuscript, one additional family member provided a saliva sample for targeted genetic testing. WGS methods are as described in detail elsewhere [1, 24]. In brief, WGS was performed at The Centre for Applied Genomics (Toronto, Canada) using DNA extracted from whole blood. Sequencing was performed with the Illumina HiSeq X system and following Illumina’s recommended protocols. Base calling and data analysis were performed using Illumina HiSeq Analysis Software (HAS) version 2-2.5.55.1311. Reads were mapped to the hg19 reference sequence using Isaac alignment software (Isaac alignment software: SAAC00776.15.01.27), and single nucleotide variants (SNVs) and small indel variants were detected using the Isaac variant caller [Isaac Variant Caller (Starling): 2.1.4.2]. These variants were annotated using a custom pipeline based on ANNOVAR . Rare variants were defined as those with ≤ 1% frequency in large public control databases [29–31]. CNVs were detected using the read-depth methods ERDS  and CNVnator  (using a window size of 500 bp). High-quality CNVs were defined as those greater than 1 kb and detected by both ERDS and CNVnator with more than 50% reciprocal overlap , and rare CNVs as those with ≤ 1% frequency in the Autism Speaks MSSNG dataset (probands and parents) . We also annotated CNVs with respect to overlap with gold standard variants in the Database of Genomic Variants (DGV) [35, 36]. For further targeted review of candidate CNVs, we used a control dataset comprised of 10,851 unrelated subjects, with a majority being of European ancestry, who were genotyped on multiple microarray platforms including the Affymetrix Genome-wide Human SNP Array 6.0, Illumina HumanOmni2.5, and Affymetrix CytoScan HD [37, 38]. All genome coordinates in this manuscript refer to NCBI Build 37 (UCSC hg19). Variants of interest were confirmed by PCR and Sanger sequencing (primers available on request) or by CMA. We conducted a comprehensive review of public, and non-public clinical and research laboratory, databases of genomic variation in disease (primarily NDD) to identify additional individuals with DMXL2, GLDN, and GRIK5 variants. We focused on smaller (< 1 Mb and < 15 genes) CNVs predicted to disrupt any of these genes (i.e., deletions impacting the coding region of the gene, and intragenic duplications), as well as predicted null SNVs and small indels. The denominator of individuals with data available for review is estimated to have been ~ 100,000. This included > 30,000 postnatal cases from Canadian laboratory clinical CMA databases, > 20,000 schizophrenia cases with CMA data from the Psychiatric Genomics Consortium , > 18,000 cases with CMA data in DECIPHER , > 23,000 cases from the Lineagen Inc. CMA database (Salt Lake City, Utah, USA), and > 6000 cases with CMA data from our ongoing ASD studies and/or WGS data from MSSNG . The proband (II-2; Fig. 1) is a 34-year-old female of Dutch ancestry with a reported history of difficulties with sensory processing and physical contact as a child. During adolescence, symptoms across a broad range of domains were reported, including conduct symptoms, attention deficit, anxiety including panic attacks, and fluctuating mood. She completed preparatory middle-level vocational education (voorbereidend middelbaar beroepsonderwijs or VMBO), the lowest level educational stream in the Netherlands. At age 28 years, Wechsler Adult Intelligence Scale—Third Edition (WAIS-III) showed a marked and unusual  difference between verbal IQ (VIQ; 79) and performance IQ (PIQ; 100). At about age 20, she received pharmacological as well as non-pharmacological treatments for symptoms of anxiety and panic. After the birth of her first child, at age 25, she was treated briefly with an antidepressant for postpartum depression. She was diagnosed with ADHD at age 27 and treated with methylphenidate. At age 33, two independent psychiatric assessments confirmed the previous diagnosis of ADHD. In addition, several aspects of ASD were mentioned and endorsed by questionnaire reports, including reduced empathic abilities, difficulties in social interaction and communication, and difficulties coping with change in her routines. Results of the Social Responsiveness Scale for Adults (reported by self and husband) and the Pervasive Developmental Disorders Screening Questionnaire were in the clinical range. However, these symptoms were evaluated as insufficient to justify a formal diagnosis of ASD. Fluctuations in mood and poor coping skills were interpreted at times as aspects of a borderline personality disorder. A subsequent psychiatric assessment at age 34 years concluded that, in retrospect, ASD was a justified diagnosis based on all available information. The early developmental trajectory of one of the proband’s daughters (III-1; Fig. 1) was marked by mild cognitive delay and a mixed language disorder (as assessed with the Clinical Evaluation of Language Fundamentals—Fourth Edition). Motor milestones were unremarkable. Her medical history was notable for a febrile seizure at age 3 years and recurrent otitis media, which was associated with temporary hearing loss. She was reported to be a highly anxious infant with a high threshold for pain and hypersensitivity to sensory input. She continued to display moderate behavioral issues as a toddler, both at home and in school, with social and communicative difficulties as well as oppositional, attentional, and anxious features. Early clinical diagnoses included developmental language disorder and disorder of childhood not otherwise specified. At 7 years 11 months, full scale IQ was assessed to be 85, with VIQ 87 and PIQ 86, using the Wechsler Intelligence Scale for Children—Third Edition (WISC-III). The most recent child psychiatric assessment performed at age 9.5 years recorded symptoms including low reciprocity, inadequate social behaviors, and behavioral rituals. Although she scored just below the clinical threshold of the Autism Diagnostic Observation Schedule (ADOS), the overall picture was deemed to justify a clinical diagnosis of ASD, in addition to the language disorder. The proband’s father (I-1; Fig. 1) was described as having longstanding difficulties with impulsivity/anger, obsessiveness, and other distressing characterological traits that interfered with his functioning. He had similar educational achievement to his daughter and has maintained stable employment without advancement or promotion. He has had at least three “nervous breakdowns” in his life that required him to take a leave of absence from his work. On the basis of this limited history, he was coded prior to WGS as likely affected with a psychiatric disorder and/or NDD. The proband’s other daughter (III-2; Fig. 1) has had normal development, and there are no concerns for ASD. She was diagnosed with Pediatric Acute-onset Neuropsychiatric Syndrome (PANS) after developing motor tics post viral infection. Although the tics initially resolved after a short course of treatment with methylprednisolone, treatment of a recurrence is ongoing. She was coded prior to WGS as unaffected with a NDD. The other two members of the family displayed in Fig. 1 (I-2 and II-1; Fig. 1) are reported to have no major learning difficulties, diagnosed psychiatric conditions, or features of a NDD. There is no known history of unexplained hearing loss in the family  nor of infertility or recurrent (> 2) miscarriage, delayed puberty, hypothyroidism, peripheral neuropathy, or short stature . Facial photographs of the proband and her two daughters are available upon request; there are no notable dysmorphic features. WGS identified the novel 262-kb loss at chromosome 15q21.2 (Fig. 2) in the proband that had been detected on CMA. The deletion was inherited from her father and transmitted to her affected daughter (Fig. 1). This deletion overlaps the entire DMXL2 gene (GenBank: NM_001174116.1) and the first three exons of GLDN (GenBank: NM_181789.3). There were no segmental duplication repeats within 200 kb of the breakpoints. No additional rare CNVs of interest were shared amongst these three family members, or between just the proband and her affected daughter. DMXL2 encodes DmX-like protein 2, previously known as Rabconnectin-3. This is a component of the human neocortex post-synaptic density (PSD) proteome  that may serve as a scaffold protein on synaptic vesicles, and it is a target of the fragile X mental retardation protein (FMRP) [44, 45]. Multiple lines of evidence, including conditional heterozygous deletion of Dmxl2 in mouse neurons, suggest that the DMXL2 protein functions in the brain in neuronal and endocrinological homeostasis . The Exome Aggregation Consortium (ExAC) probability of loss-of-function intolerance (pLI) of DMXL2 is 1.00, with tenfold fewer observed variants than anticipated . DMXL2 is in a copy number-stable region of the genome; no deletions of DMXL2 were found in the DGV gold standard variants (Fig. 2) or in our CNV control datasets (see the “Methods” section) . The DMXL2 gene contains “brain-critical exons” . Two de novo missense variants in DMXL2 were previously observed in 2517 simplex ASD probands from the Simons Simplex Collection (SSC), with no de novo events in this gene observed in their unaffected siblings [5, 6]. There is also evidence of enrichment for rare sequence variants in DMXL2 in major depressive disorder . With respect to the other gene overlapped by the 15q21 loss CNV, GLDN encodes the protein gliomedin, a secreted cell adhesion molecule involved in the formation of the nodes of Ranvier . In contrast to DMXL2, the ExAC pLI is 0.00 and a deletion was observed in one of our control individuals, suggesting there may not be overt clinical consequences for a heterozygous null allele. Biallelic loss of function of GLDN causes a lethal congenital contracture syndrome (MIM #617194), and as expected, carrier parents were described as unaffected . Considering SNVs and small indels, there were no likely pathogenic or pathogenic variants  in established NDD risk genes in any of the six family members. A total of 198 high-quality, rare, predicted damaging variants were shared by the three family members coded as affected (I-1, II-2, III-1; Fig. 1), including 89 that were absent in the proband’s unaffected daughter (III-2). One of these 89 is a missense variant of uncertain significance in GRIK5 [NM_001301030: c.1840G>A: p.(Ala614Thr)]. It is absent in control databases, affects a highly conserved amino acid, and is predicted to be damaging by in silico programs including SIFT (score 0), PolyPhen-2 (score 0.977), MutationTaster (probability 0.999), and CADD (scaled C-score 32). GRIK5 encodes an understudied auxiliary subunit of the kainate receptor (glutamate receptor, ionotropic, kainate 5). Dysregulation of other components of this receptor has been associated with psychiatric and neurodevelopmental diseases [50–54]. In ExAC, GRIK5 is constrained with respect to loss-of-function (pLI = 0.92) and missense (z = 3.85) variants. There are no coding CNVs in our control databases impacting GRIK5. Similar to DMXL2, prior evidence for an association with ASD is derived from the SSC and Autism Sequencing Consortium, where there were three de novo missense variants in the GRIK5 gene in simplex ASD probands and none in the unaffected SSC siblings [4–6]. We also identified three high confidence de novo exonic variants. In the proband (II-2), there was a 2-bp frameshift deletion in exon 10 of ZC3H14 [NM_024824.4: c.1339_1340del: p.(Leu447Alafs*8)] and a synonymous substitution in exon 3 of TRPC4 that was not predicted to affect splicing. ZC3H14 plays a key role in neurodevelopmental processes [55, 56]. The gene is associated with an autosomal recessive form of ID (MIM #617125) , but is also constrained against loss-of-function variants (ExAC pLI = 1), suggesting that it may be sensitive to haploinsufficiency. However, the de novo frameshift variant was transmitted only to the proband’s unaffected daughter (III-2; Fig. 1). The affected daughter (III-1) has a novel de novo missense variant in exon 3 of DLGAP3 [NM_001080418.2: c.33 T>A: p.(His11Gln)]. This gene is a member of the DLGAP family that has been studied in relation to various neuropsychiatric disorders . However, in silico predictions suggest the missense change here will have a benign impact. No de novo exonic variants were identified in the unaffected daughter (III-2). Much larger deletions encompassing the 15q21.2 locus are associated with ID and other features [59, 60]. A comprehensive review of public databases identified a single comparable 274-kb 15q21 loss (Fig. 2), in DECIPHER . The individual is a 21-year-old Belgian male with diagnoses of mild ID, ASD, and ADHD (case 4 in Table 1). Growth parameters were within normal limits (weight 71.5 kg, height 168 cm, head circumference 56.4 cm), and there were no major congenital anomalies or notable dysmorphic features. Inheritance of the CNV could not be assessed as the proband was adopted. Seven other individuals with CNVs predicted to disrupt DMXL2 were identified in private clinical laboratory databases (cases 5–11 in Table 1), with available phenotype data supporting a primary NDD phenotype in most. Additional CNVs disrupting DMXL2 were identified in schizophrenia probands (cases 12–13 in Table 1) in the PGC , and novel loss-of-function SNVs were identified in ASD probands (cases 14–17 in Table 1) in the Autism Speaks MSSNG study . Similar efforts to identify variants in GRIK5 were not successful, with only a single exonic deletion found in the MSSNG cohort (data not shown). We employed WGS and a multifaceted strategy to characterize a CNV of uncertain clinical significance. Diverse and converging lines of evidence suggest that haploinsufficiency of DMXL2 is a risk factor for NDDs. The available data indicate variable expressivity and possibly incomplete penetrance (or at least age-related penetrance). Families exhibiting an apparently heritable but broad phenotype of NDD symptoms, including members with and without a clinical diagnosis of ASD, can expand our knowledge of the genetically related spectrum of disease. One of the most pressing challenges in the field is to understand the typically high degree of variable neuropsychiatric expression associated with risk variants [61, 62]. The range of symptomatology observed in this family is reminiscent of what is often observed with genomic disorders and non-recurrent large CNVs, and it should further highlight the impact of rare inherited genetic variants [18, 22, 63, 64]. In some cases, there is emerging evidence for additional deleterious variants elsewhere in the genome that may act as modifiers [65, 66]. We also identified de novo and inherited sequence variants of potential relevance in this family, including a rare missense change in GRIK5. The latter was not as compelling of a candidate variant as the microdeletion overlapping DMXL2 because of (i) the predicted less-severe nature of the genetic lesion, (ii) the current absence of overt functional or model organism data at the gene level, and (iii) our inability to adequately replicate the finding in the population-scale NDD cohorts. Nonetheless, it could still be a contributor to the risk for NDD in this family. A limitation of our study was that the relatively small nuclear families precluded the identification of an individual with one, but not both, of the variants. Our findings provide a clinical impetus to now develop and test functional hypotheses regarding disease mechanism(s). The Dmxl2 gene is best studied in the gonadotropin-releasing hormone neurons [42, 67], where low expression in mice impedes normal dendritic development . However, the phenotypes observed in knockout mice are not entirely attributable to deficient Dmxl2 in that neuronal cell population . Dmxl2+/− mice also demonstrate neuroanatomical differences in the corpus callosum . At least four of ten experimentally proven protein interactors of DMXL2  are encoded by established or candidate genes for NDDs: CYFIP2 [70, 71], DYNC1H1 [72, 73], MATR3 , and NCKAP1 [5, 75, 76]. Both CYFIP2 and NCKAP1 shape the formation of dendritic spines via the WAVE actin-remodeling complex [77, 78]. DMXL2 protein dosage insufficiency may therefore result in structural (e.g., abnormal dendritic spines morphology) and/or functional (e.g., impaired transmission) synaptic consequences in humans, as have been observed in other genetic forms of ID, ASD, and schizophrenia [79, 80]. It remains difficult in clinical practice to interpret novel inherited CNVs, which are often labeled variants of uncertain clinical significance . Incomplete penetrance and epistasis are likely underappreciated. Most approaches to CNV adjudication focus on the overlapped genes and disregard the remainder of the genome , in part because CMA is incapable of identifying smaller and balanced genetic variants. Whereas WGS is more comprehensive in detection [1, 24–26], sometimes also revealing complicating data for clinical interpretation, as was the case with the GRIK5 variant. Updated guidelines are required for interpreting CNVs that take into account sequence variants . Specific consideration will need to be given with respect to how to determine if two or more variants are major contributors to disease within a specific individual. The risk profile from common variants with a polygenic effect may also become clinically relevant in time, even in those individuals with a monogenic diagnosis or genomic disorder [82, 83]. Variant inheritance patterns in multigenerational pedigrees can be highly informative, with the caveat that customary assumptions (e.g., de novo suggests pathogenic, and inherited from putatively unaffected parent suggests benign) are imperfect [84–86]. The availability of samples and detailed phenotype data from three generations of a family, including offspring and parents of an individual with ASD or other NDD phenotypes, is uncommon . There is substantial evidence that different rare disease-causing variants can segregate within the same family [1, 3]. Our approach here of examining multiple rare penetrant variants across generations might reveal new genes for NDD. This may especially be the case for genes involved in higher functioning forms of ASD, perhaps including DMXL2. Our study design also allowed for the observation that the proband’s de novo variant in ZC3H14 was not inherited by her daughter with NDD. In contrast, both the 15q21 deletion and the GRIK5 variant did segregate with the apparent NDD phenotypes, albeit in a simple pedigree where the a priori probability was p = 0.125 for any single variant . These results support DMXL2 as a candidate gene for a spectrum of NDDs that includes ASD. As for virtually all (even highly penetrant) risk variants, additional modifiers of expression remain to be discovered. The robust interpretation of ultra-rare variants identified by CMA or other testing requires incorporation of WGS from affected families and population-scale data. Although currently expensive for clinical diagnostics , in time, we expect the same utility will be found as in this research study and WGS will become a first-tier clinical genetic test for NDDs. Gregory Costain and Susan Walker contributed equally to this work. The authors thank the family for their participation, and staff and trainees at The Centre for Applied Genomics. The authors wish to acknowledge the resources of MSSNG (www.mss.ng), Autism Speaks and The Centre for Applied Genomics at The Hospital for Sick Children, Toronto, Canada. They thank the participating families for their time and contributions to this database, as well as the generosity of the donors who supported this program. This study also makes use of data generated by the DECIPHER community. A full list of centres who contributed to the generation of the data is available from http://decipher.sanger.ac.uk and via email from decipher@sanger.ac.uk. Funding for the project was provided by the Wellcome Trust. (1) Funding support for the Study of Addiction: Genetics and Environment (SAGE) was provided through the NIH Genes, Environment and Health Initiative [GEI] (U01 HG004422). SAGE is one of the genome-wide association studies funded as part of the Gene Environment Association Studies (GENEVA) under GEI. Assistance with phenotype harmonization and genotype cleaning, as well as with general study coordination, was provided by the GENEVA Coordinating Center (U01 HG004446). Assistance with data cleaning was provided by the National Center for Biotechnology Information. Support for collection of datasets and samples was provided by the Collaborative Study on the Genetics of Alcoholism (COGA; U10 AA008401), the Collaborative Genetic Study of Nicotine Dependence (COGEND; P01 CA089392), and the Family Study of Cocaine Dependence (FSCD; R01 DA013423). Funding support for genotyping, which was performed at the Johns Hopkins University Center for Inherited Disease Research, was provided by the NIH GEI (U01HG004438), the National Institute on Alcohol Abuse and Alcoholism, the National Institute on Drug Abuse, and the NIH contract “High throughput genotyping for studying the genetic contributions to human disease” (HHSN268200782096C). The datasets used for the analyses described in this manuscript were obtained from dbGaP at https://www.ncbi.nlm.nih.gov/projects/gap/cgi-bin/study.cgi?study_id=phs000092.v1.p1 through dbGaP accession number phs000092.v1.p1. (2) The authors acknowledge the contribution of data from Genetic Architecture of Smoking and Smoking Cessation accessed through dbGaP. Funding support for genotyping, which was performed at the Center for Inherited Disease Research (CIDR), was provided by 1 X01 HG005274-01. CIDR is fully funded through a federal contract from the National Institutes of Health to The Johns Hopkins University, contract number HHSN268200782096C. Assistance with genotype cleaning, as well as with general study coordination, was provided by the Gene Environment Association Studies (GENEVA) Coordinating Center (U01 HG004446). Funding support for collection of datasets and samples was provided by the Collaborative Genetic Study of Nicotine Dependence (COGEND; P01 CA089392) and the University of Wisconsin Transdisciplinary Tobacco Use Research Center (P50 DA019706, P50 CA084724). The datasets used for the analyses described in this manuscript were obtained from dbGaP at https://www.ncbi.nlm.nih.gov/projects/gap/cgi-bin/study.cgi?study_id=phs000404.v1.p1 through dbGaP accession number phs000404.v1.p1. (3) A dataset used for the analyses described in this manuscript were obtained from the NEI Refractive Error Collaboration (NEIREC). Funding support for NEIREC was provided by the National Eye Institute. We would like to thank NEIREC participants and the NEIREC Research Group for their valuable contribution to this research. The datasets used for the analyses described in this manuscript were obtained from dbGaP at https://www.ncbi.nlm.nih.gov/projects/gap/cgi-bin/study.cgi?study_id=phs000303.v1.p1 through dbGaP accession number phs000303.v1.p1. (4) Funding support for the “CIDR Visceral Adiposity Study” was provided through the Division of Aging Biology and the Division of Geriatrics and Clinical Gerontology, NIA. The CIDR Visceral Adiposity Study includes a genome-wide association study funded as part of the Division of Aging Biology and the Division of Geriatrics and Clinical Gerontology, NIA. Assistance with phenotype harmonization and genotype cleaning, as well as with general study coordination, was provided by Heath ABC Study Investigators. The datasets used for the analyses described in this manuscript were obtained from dbGaP at https://www.ncbi.nlm.nih.gov/projects/gap/cgi-bin/study.cgi?study_id=phs000169.v1.p1 through dbGaP accession number phs000169.v1.p1. This study was funded by The Centre for Applied Genomics, The Hospital for Sick Children, Genome Canada, Autism Speaks, the Canadian Institutes of Health Research (CIHR), the Canadian Institutes for Advanced Research (CIFAR), Ontario Brain Institute, the Government of Ontario, Canada Foundation for Innovation (CFI), and the University of Toronto McLaughlin Centre. S.W.S. holds the GlaxoSmithKline-CIHR Endowed Chair in Genome Sciences at The Hospital for Sick Children and the University of Toronto. The funding bodies played no role in the design of the study, the collection, analysis, and interpretation of data, or the writing of the manuscript. The dataset generated during the current study will be deposited in an open-access repository. GC, SW, and SWS designed the study and analyzed and interpreted the data. The other co-authors made substantial contributions to conception and design, acquisition of data, and/or analysis and interpretation of data. GC, SW, and SWS drafted the manuscript, and the remaining authors were involved in revising it critically for important intellectual content. All authors have given final approval of the version to be published. This study was approved by our local institutional Research Ethics Board, and consent to participate was provided by all participants. The participants provided consent for publication of this manuscript. S.W.S. is on the Scientific Advisory Committees of Deep Genomics and Population Bio, and Lineagen licenses intellectual property based on his discoveries from The Hospital for Sick Children. A.P., M.A.S., and H.T. are employees of Lineagen. The remaining authors declare that they have no competing interests.